Want to try something new with your embroidery? 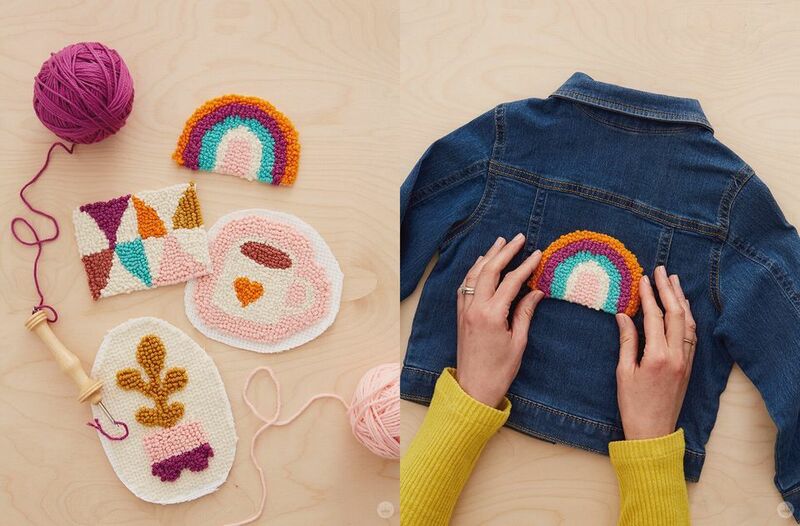 Give punch needle a go with these fun and fresh patterns and kits! Punch needle embroidery isn't new, but it is popular once again, and it's looking modern with bright colors and popular motifs. Unlike traditional embroidery, punch needle doesn't require lots of different stitch techniques. You just push the punch needle tool (and yarn or thread) through the fabric for each stitch. The process takes a little practice, but once you get it, you'll be stitching faster than ever and creating fun textures with embroidery! As you learn the punch needle process, it helps to start with a simple design. This free pillow cover tutorial is perfect for that. With large areas of solid color, you can get into the rhythm of punching the stitches. Most punch needle designs use yarn and a large punch needle tool, but this succulent design uses regular embroidery thread and a smaller needle. The result is similar to filling in areas with long and short satin stitch. Suter Design Co. offers other patterns for punch needle and traditional embroidery, so if succulents aren't your thing, check out the other designs. Autumn Bouquet Embroidery Pattern, $5, Suter Design Co. These sweet creatures aren't just a single pattern; they're part of a beginner's guide ebook that features instructions and tips, as well as patterns and tutorials, for three punch needle projects. What a great way to get started! Depending on the size of the materials and the direction you work, punch needle stitches can look quite different. This grapefruit purse shows two sizes of loops in standard embroidery floss. Although it doesn't include project instructions, this free download from Hobby Lobby offers several patterns and lots of inspiration! Arounna Khounnoraj, designer and author of Punch Needle, teaches punch needle workshops around the world as well as online. Her bold and beautiful designs are easily recognizable and work well for beginners. This tutorial from the Think. Make. Share. blog by Hallmark shows how simple designs make some of the most fun punch needle projects. Although the post doesn't include the patterns themselves, it does give you an idea of how you can make your own with oversized doodles or clip art. Punch Needle Patches from Think. Make. Share. Florals are always a popular choice for embroidery, and this pattern from The Comptoir shows how one pattern can look very different with a few small changes. The outlined version is bold, while the plain version looks softer. But you can also adjust the stitch direction for a whole other texture! If you love the look of solid, filled-in embroidery, you'll love this jacket idea from Mariane Dekkers-Roos. She shares the free pattern for this hearts and flowers design, which fits perfectly on the back of a denim jacket. Use a light coating of glue on the reverse side so those stitches stay secure when it goes through the wash.
Punch needle is often at the more expensive end of embroidery projects, and that's due to special tools and wool yarn. Of course, the result is a cozy, plush project that you're proud of. That's certainly true of this deluxe kit from Fancy Tiger Crafts. 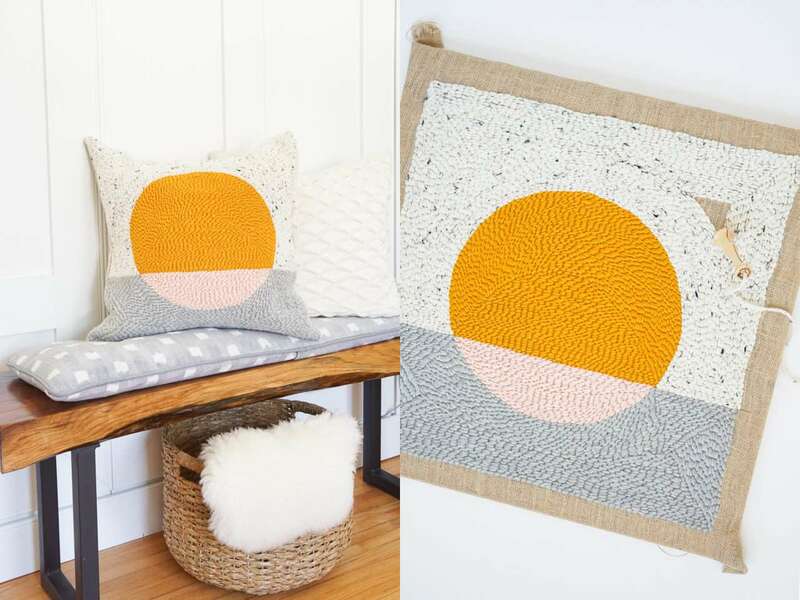 Be sure to note which extra supplies you may need to complete your punch needle pillow. Making punch needle art of an artist? What could be better? Cupcake Cutie offers a few punch needle patterns in her Etsy shop, but Frida Kahlo is her most iconic design. Stitch this portrait to brighten your walls and show off your skill! Aside from the process, one of the biggest differences between punch needle and traditional embroidery is the loopy texture punch needle creates. Grab this free pattern for an autumn leaf cushion and you won't be able to help but run your fingers over the soft pile. While it might take some practice for kids to actually do punch needle, that doesn't mean you can't make them something fun with the technique! This french dinosaur kit looks fierce, but it's also a delight for kids to snuggle. Make your punch needle embroidery into something useful with this sunglasses case tutorial from Punchneedle Gang. The free downloadable PDF includes tips, instructions, and the flower patterns you need to make your own no-sew pouch.